Anyone would tell you that Punjabis love their breakfast—and it’s mostly a zesty breakfast of parathas enjoyed with a dollop of butter, a cup of curds or a huge glass of lassi and of course, tongue-tickling pickles. From Aloo, Gobi, Palak, Methi or Mooli Parathas to nouveau treats like the Cheese Paratha, there is an endless variety to choose from. And of course, they also enjoy combining ingredients in their stuffing, such as Methi and Aloo, Methi and Palak or Aloo and Gobi. It is common to see people using leftover subzis from the previous day’s dinner to stuff their breakfast parathas. Aloo Gobi Subzi, for example, is an awesome stuffing for whole wheat parathas! It’s handy and tasty, and avoids wastage. Dairy products being in abundance in Punjab, they usually feature in every meal. Do not be surprised if you see a huge dollop of homemade white butter on your paratha the next time you have breakfast at a Punjabi household. As the white butter melts in the heat of the freshly-made paratha and coats it, it gives out a very appetizing aroma and improves the flavour too. The parathas are usually enjoyed with a cup of curds and mango pickle. Add a tall glass of lassi to the spread, and that’s the best breakfast you could ever have tasted! Beware – those who are not used to it tend to get sleepy after such a sumptuous treat. A seasoned Punjabi though can comfortably down this breakfast and get to work within minutes! Apart from stuffed or flavoured parathas, Punjabis also like to have kulchas, bhaturas and laccha parathas for breakfast. Chole is also very popular. It is served with bhaturas or other breads too. In a proper Punjabi village, the breakfast can be as simple as leftover tandoori roti with a big dollop of homemade white butter and sugar along with a cup of steaming tea. Punjabis also enjoy something crispy with their breakfast. Pakodo or Pakora seems to be very popular and you can find several interesting options here. Bread Pakora is the top choice though! Eggs may also be had, as Masala Omelette, Egg Bhurji Paratha, or other forms. Nowadays, we also find Punjabis enjoying breakfast recipes from other parts of the country, like Idli and Poha! We have brought together some of the all-time favourite Punjabi breakfasts here. You will also find many more interesting options on our website and app. 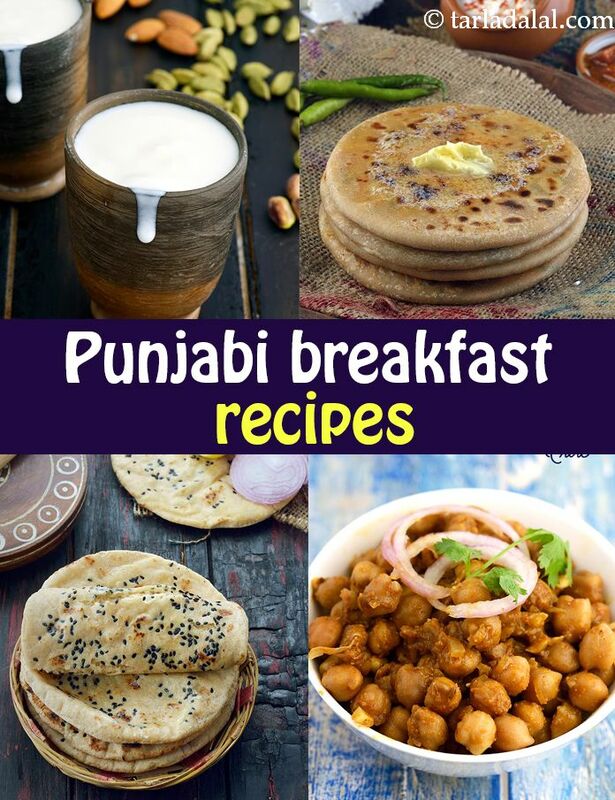 We hope you enjoy our collection of Punjabi Breakfast Recipes. Loved your collection of Punjabi recipes. Yes we do love our white butter with all kids of parathas. Also good collection of Kulchas and Chole.